Looking to break a three-game losing streak, the Raiders once again got off to a slow start. After forcing a punt on defense, starting quarterback Derek Carr threw an interception on just the second play from line of scrimmage. 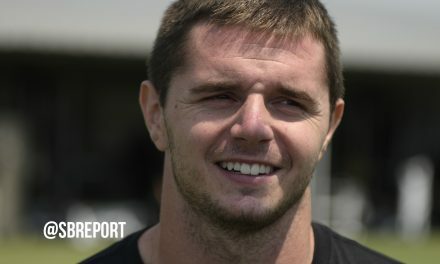 Carr missed last game with a back injury. The turnover gave Philip Rivers and the Chargers offense the ball at the 30-yard line. But the Raiders defense stopped them, forcing a 48-yard field goal that Nick Novak missed wide right to keep the game scoreless. The missed field goal gave the Raiders offense new life as Carr capitalized with an 11-play drive that culminated in a 23-yard touchdown pass to veteran receiver Michael Crabtree. Unfortunately though that “new life” would be short-lived. 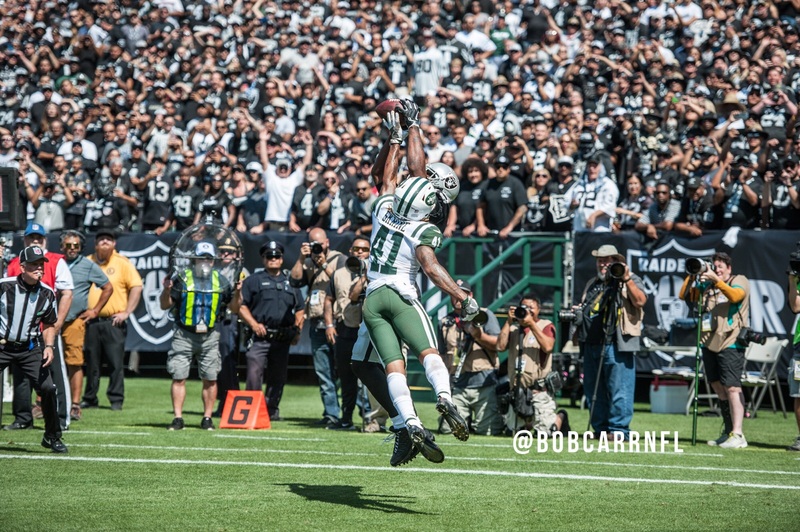 With Carr and the Raiders offense puttering once again, Rivers took advantage by finally getting his team into the end zone in the second quarter. On the drive, the Chargers converted third-down conversions on 3rd-and-7, 3rd-and-8 and 3rd-and-9. The drive ended with a one-yard touchdown run by Melvin Gordon on fourth down, tying the game. The score did give the Raiders one last chance to get on the scoreboard before half, getting the ball with just over 90 seconds left and one timeout. Carr would use the underneath pass to get the Raiders back into field goal range and take the 10-7 lead heading into half. After deferring the first-half kickoff, the Raiders looked like they would extend their lead on the first drive of the second half. 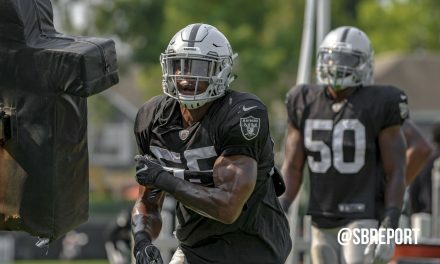 With the team deep into Chargers territory, Carr’s pass to Marshawn Lynch went off his hands and into Chargers middle linebacker Hayes Bullard’s hands. Both teams would remain scoreless until the fourth quarter when Rivers continued to attack the Raiders defense with his running back. Gordon hauled in nine receptions for 67 yards, including a six-yard screen pass that caught the Raiders off-guard and giving the Chargers their first lead of the game at 14-10. With their hopes agains the rope, offensive coordinator Todd Downing reverted to some trickery. Speedster Cordarrelle Patterson took an end around past the defense, going 47 yards for the Raiders second touchdown of the game. Unfortunately, Jon Condo’s snap on the extra point went high and kicker Giorgio Tavecchio’s extra point missed wide, making it just a two-point lead at 16-14. It was Tavecchio’s first-career miss in the NFL, and it was a costly one. 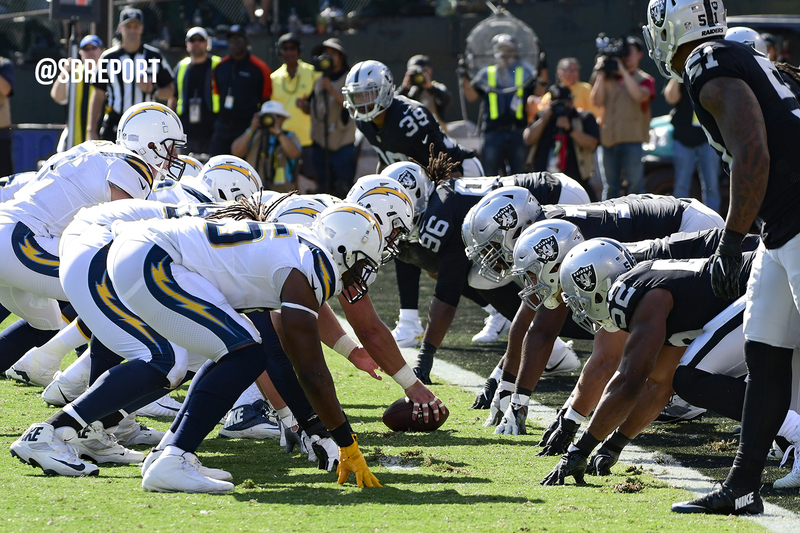 The Raiders offense had a chance to put the game away after the defense forced a three and out, but Carr responded with a three-and-out of their own. Another beautiful punt by King gave Rivers one last chance from his own eight-yard line with over four minutes left in the game. Rivers attacked the defense at one of their weakness, finding tight end Huntry Henry for two big completions to get the Chargers into Raiders territory. From there, the Raiders would pound Gordon up the middle while running the clock out and getting into better field goal range. Nick Novak would punch it through from 32 yards out to hand the Raiders their fourth-straight loss. The loss puts the Raiders at 2-4, dead last in the AFC West. Not a good situation for a team that had hopes of reaching the Super Bowl and is now turning around on a short week to host the division-leader Kansas City Chiefs on Thursday Night Football.